Through the lens of 2016, this ad’s copy might not be up to snuff. 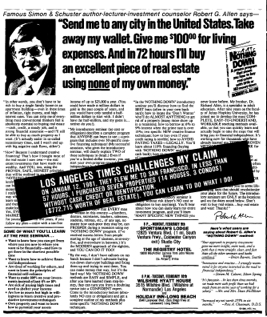 But it wasn’t scintillating ad copy that kept Robert Allen’s ads and spots going strong for decades. Allen had countless competitors in the “nothing down” real estate market — a market that’s making a minor comeback after years of hibernation. But of all the “nothing down” and real estate investment marketers, Robert Allen is one of the last standing after 35 years at it. 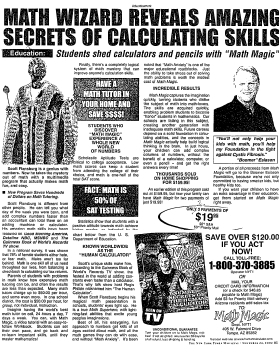 The “Math Magic” course was successful in print for many years and, like the “Total Transformation” campaign, is a great example of educational advertising using direct response. 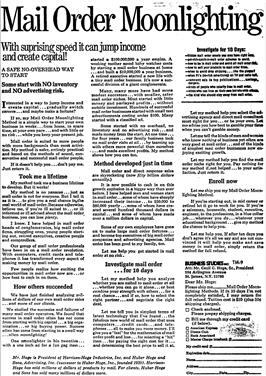 If you’ve heard the story of a young Gene Schwartz working one day in the mail room and a few short years later becoming a mail order millionaire, then here is an interesting ad. It was written in 1975 by the man who showed Gene the ropes in the early 50s, Cecil Hoge, the founder and president of the Huber Hoge, Inc. The promise of this ad is essentially a stone’s throw away from the internet marketing pitches that plague us today…but there’s a key difference. Most of those offers lack the sophistication of even hinting that they might not be for you.